Green leafy vegetables rule the nutrition world, but the benefits of kale make it king of the hill. Try these 7 delicious recipes to make this nutritional powerhouse a part of your meal plan! Green vegetables are nutritional powerhouses! For many of you, that statement comes as no surprise. From broccoli and spinach to Brussels sprouts and bok choy, green, cruciferous vegetables are known for the benefits of their green leaves and florets. Among the list of good-for-you veggies is a little nutritional standout called kale. Not a food to be overlooked, kale brings a lot to the table. Along with potential cholesterol-lowering properties, one cup of kale provides about 10 percent of the recommend daily amount of omega-3 fatty acids and contains two powerful antioxidants: carotenoids and flavonoids. Together, these may reduce your risk of various forms of cancer and heart disease. In fact, with over 45 different types of flavonoids alone, kale offers serious benefits! Kale is also packed full of micronutrients like manganese, copper, calcium, potassium, and vitamins K, A, and C, which makes it an amazing form of vitamin and mineral support for your active body. If you've been hesitant to add kale to your diet because you're not sure what to do with it, it's time to break out some delicious recipes. Try one of them tonight! Move over, Lays. These kale chips will satisfy your craving for something crunchy, and they're the perfect alternative to potato chips. They're relatively low in calories and allow you to snack on veggies in a different way. The best part? There are no greasy fingers to hinder your grip on the bar for those sweet, post-snacking deadlifts and push presses. Want a low-carb breakfast option to start your day? 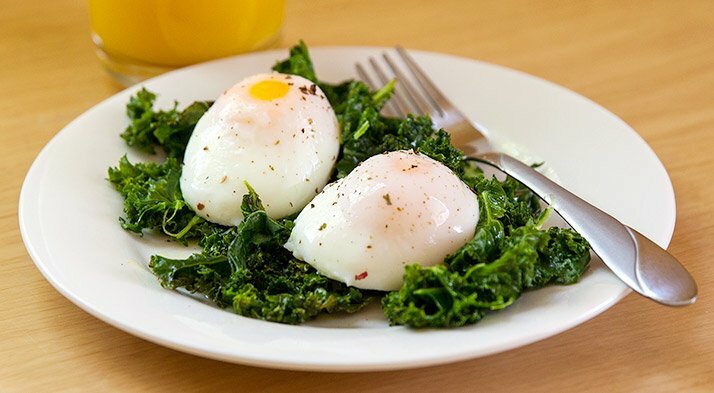 Try poached eggs over kale. The combination of gooey egg yolk and crisp kale will be enough to make your taste buds dance, and with a healthy balance of proteins, fats, and fiber, your muscles will thank you. For a refreshing, citrus finish, serve with a slice of orange. If you're looking for a nutrient-packed side dish to accompany your main protein source, this recipe fits the bill perfectly. 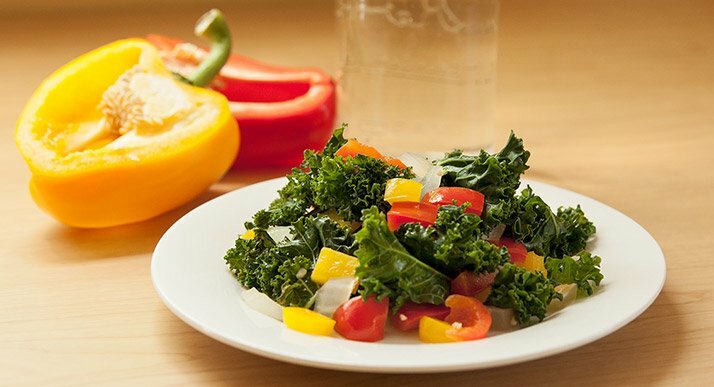 You'll get a solid dose of vitamin C from the peppers, along with all of kale's own considerable nutrient power. Add in some garlic and ginger and you'll also get immune-boosting and heart-protecting benefits with your meal. 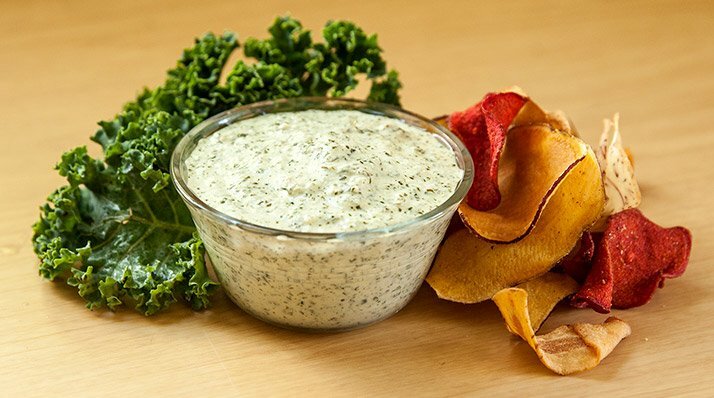 Classic spinach dip often means a slathering of saturated fat from mayonnaise and sour cream. This clean version cuts out the progress-killing macros while keeping the creaminess intact with a serving of Greek yogurt. Replace the typical bread-and-tortilla dippers with freshly diced vegetables and this recipe really earns its seat on the healthy foods train! It's a taste-bud-punching snack that's sure to be the highlight of the party. Chicken soup is great, but add some veggies to it and it becomes even greater! This soup is rich in fiber, complex carbohydrates, lean protein, and antioxidants, so it's something you can feel good about putting into your body. Feel free to add other vegetables as desired! In the mood for a breakfast smoothie? Add some kale to it! 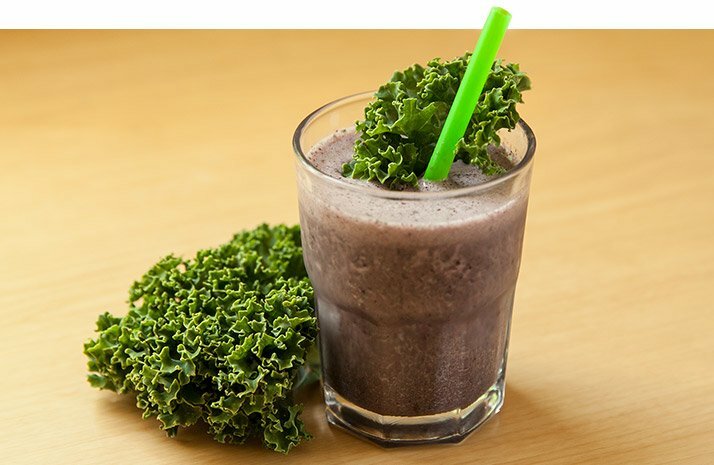 Kale can make for a perfect addition to any fruit smoothie you might want to whip up, inconspicuously adding an extra serving of greens to your day. With the mix of other flavors, you'll drink down the benefits without it tasting like you're having a "green"—read, earthy—smoothie. 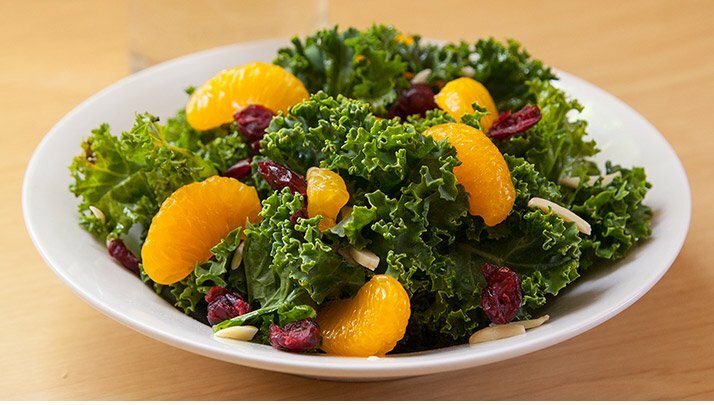 Sweet mandarin oranges and hearty kale mix together perfectly in this nutrient-packed salad. Add a grilled chicken breast or some grilled sirloin for protein if you want to build a complete and balanced meal!